5x FLUSH FIT 12/24V LED RED MARKER LIGHTS. Clear Lens with Twin Red LEDs. Pre Wired with 500mm Cable. Complete with black screw cap covers. 57.6mm (Between Mounting Hole Centre). 83mm (Length) x 24.5mm (Width) x 18mm (Depth). Model W150DD. Functions Stop / Tail / Progressive Indicator / Reverse / Reflector. LAMP SPECIFICATIONS. Connection Fly Lead. Position on Vehicle Left / Right Hand. Technology LED. Vehicle Warning & Hazard. LA LIGHTBARS UNIVERSAL LED NUMBER PLATE SURROUND. Complete with x3 Red (Back) or White (Front) LED's. Genuine Hella light. Takes 2x either 12v or 24v 10W bulbs (Not supplied). Northern Ireland (BT) HS, IV 41 to 49, IV 51, 55 & 56. KA 27 & 28, KW 15 to17. PA 20, PA 41 to 49, PA 60 to 78, PH 42 to 44. Fit for 12v vehicles.Ideal for cars,trailers,truck etc. No screws or bolts are supplied, just the marker light. Distance between fixing holes:45mm. Color: Amber. 2 wires (white & red). 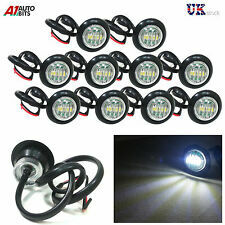 10x FLUSH FIT 12/24V LED AMBER MARKER LIGHTS. Clear Lens with Twin Amber LEDs. 83mm (Length) x 24.5mm (Width) x 18mm (Depth). Pre Wired with 500mm Cable. Vehicle compatibility only an example of vehicles you could fit this universal light to . 3 SMD LED Front /Side /Rear Marker Lights. Life Span: 50000 hours. Waterproof Level: IP68. Material: ABS. Color: White/Clear. Rubbolite Truck-Llite BNIB. Set of two, Model 12V - 24V. 758/03/05 - LH. POSITION TRUCK TRAILER LORRY BUS CAB CARAVAN HGV. 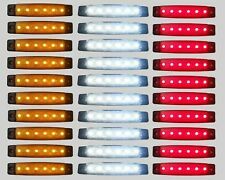 10X ORANGE 10XRED 10XWHITE 24V LED 6 SMD SIDE MARKER LIGHTS. New SMD LED technology- much brighter than ordinary LEDs. DISTANCE BETWEEN FIXING HOLES : 85 MM. Tail (rear) light. 5 chambers with functions - Reverse light. - Brake (stop) light. LONG LIFE SPAN. STOP and TAIL - 10 x LED. 12V FAST RESPONDING BRIGHT LEDS WITH HIGH OUTPUT. REVERSE - 4 x LED. CABLE EXITS : BLACK-NEGATIVE / BLUE - TAIL / RED - STOP / YELLOW - INDICATOR. INDICATOR - 5 x LED. 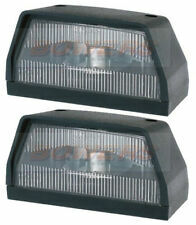 2x 8 LED Tail/Turn Signal/Reflector Lights. INDICATOR - 4 x LED. 12V FAST RESPONDING BRIGHT LEDS WITH HIGH OUTPUT. FITTING WITH 2 BOLTS M5 ( FIXING CENTRE 70 mm ). STOP /TAIL-4 x LED. CABLE LENGTH : 20 cm. 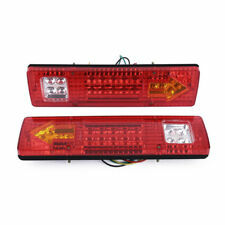 12/24V LED UNIVERSAL REAR ROUND HAMBURGER COMBINATION TAIL LIGHT. Super Bright LEDs. Plastic Body & Lens. Many Possible applications including HGVs, Lorrys, Recovery Vehicles, Trucks, Buses, & Trailers. 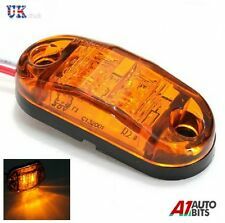 2pcs Trailer Truck Lorry Lollipop Earring Amber/Orange Mirror Side Maker Lamp Light 24V. 2x Side Maker Light. Light Color:Amber. White Wire - Positive. Wire Length:22cm. Detail Image. Fitting Bolt Size:M10. 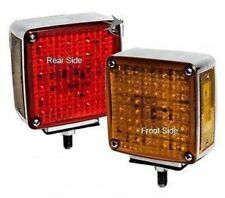 Set of 2 PCS Boxed Recovery Tail Stop Lights with number plate light on the left Lamp. - Tail (rear) light. 5 chambers with functions - Reverse light. Standard bulbs R5W, R21W and R21/5W needed. Works on 12V and 24V (depending on bulbs installed). Pair Rear Tail Lights (left and right). Rear (tail) light. Distance between fitting bolts: 155 mm. Reverse light. S top (brake) light. Winker (indicator) light. 2 x 24V LED REAR LIGHTS. LONG LIFE SPAN. CABLE EXITS : BLACK-NEGATIVE / BLUE - TAIL / RED - STOP / YELLOW - INDICATOR / WHITE - REVERSE / GREEN - FOG / BROWN - SIDE TAIL. TAIL - 40 x LED. 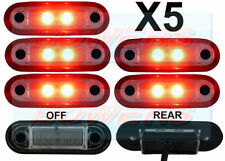 SIDE TAIL - 7 x LED. Rubbolite Interior Lamp - Part No 46/02/00. Interior lamp. Single Pole. Festoon Bulb. Bulbs not included. Red Tail (Rear) Light. 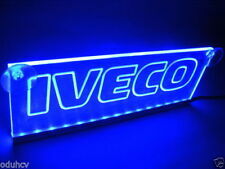 Thin design 92 LEDs inside each lamp for trucks, chassis, trailers, campers, tippers, boxes, buses etc. - White Reverse Light. Unit size: 338 mm length, 125 mm width, 27 mm depth. 30pcs set 12V LED 6 SMD AMBER SIDE MARKER LIGHT POSITION TRUCK TRAILER LORRY BUS CAB CARAVAN HGV. DISTANCE BETWEEN FIXING HOLES : 85 MM. COLOR: AMBER. New SMD LED technology- much brighter than ordinary LEDs. Yellow Wire: Indicator. Distance between mounting bolts: 45mm. Super Bright LEDs. Pre-wired with 900mm cable. White Wire: Earth/Ground. Vehicle compatibility only an example of vehicles you could fit this universal light to . 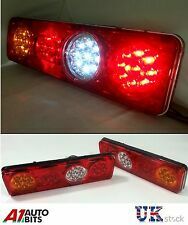 LORRY / TRUCK LED REAR LIGHTS. FREE P P WITHIN THE UK. 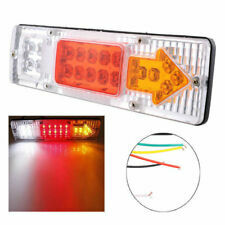 These can be used for side marker lights, signal lights, rear lights, etc. 10x Amber 2 LED Side Markers Lights. LED quantity: 2 LED. Spring Festival Sale. Light Color: Amber. Size: 110 x 80 x 30 mm. BEFORE you start your LED kit installation, verify the polarity on your vehicle by simply plugging the LED bulb into your vehicle socket. Rubbolite Blue magnetic Rotating Beacon light. Genuine Rubbolite. Easy Magnetic fixing. Plugs straight in to the Cigarette Lighter. Black Plastic Casing. Clear Glass Lens. Distance between fitting centers: 49mm. for exterior and interior usage. Wires length: 125mm. 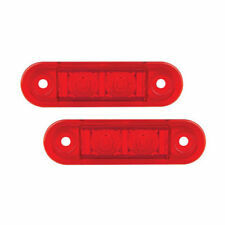 2 X LED SMD mini side rubber marker lights. LED QTY:2PCS 12SMD. Color:red white. Car Parts & Accessories. Material:TPU AS. Product View. Compatible with all vehicles on 12V and 24V. 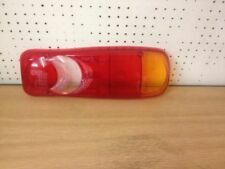 4x LED Side Marker Lights (2 pairs = 2 Left and 2 Right). Triple function: front, side, rear marker lights. Distance between fitting holes: 78 mm. SMD LED is much brighter and less power conumping. Tail (Rear) Light. LONG LED LIFE > 20,000 hours. 36 LEDs inside each lamp. Three Chambers. Unit size Functions as follow Easy for installation. With progressive Audi / VW style swooping LED amber indicator light. 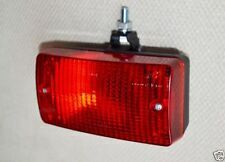 Universal flat surface mount LED rear light, Ideal for trailers or caravans. VEHICLE COMPATIBILITY IS ONLY A GUIDE TO WHAT YOU COULD FIT THIS UNIVERSAL LIGHT TO . Led Truck Trailer Lights x two. Suitable for trailer boards, trailers, kit-cars etc. • Polycarbonate lens. • Flush Mounting. • Pre wired with flylead attached. All of the red LEDs illuminate when the tail lights are on and get brighter when the brakes are applied. Tail Light Function Uses 5 LEDs. Many possible applications including HGVs, Lorrys, Recovery Vehicles, Trucks, Buses, Trailers, Kit Cars, Vans & Caravans. 10X 3 SMD LED Front /Side /Rear Marker Lights. Waterproof Level: IP68. Life Span: 50000 hours. Material: ABS. Color: White/Clear. 3 LED'S IN EACH MARKER. 5 CM / 3 CM BETWEEN FITTING CENTERS ON THE BRACKET. FOR ALL VEHICLES WITH 12 & 24 VOLTS SYSTEM. Genuine Hella light. 130mm (Length) x 60mm (Width) x 40mm (Depth). Built in reflector. 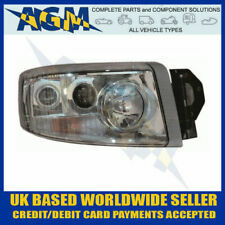 SQUARE 12/24V LED WHITE FRONT MARKER LIGHT. Vehicle compatibility only an example of vehicles you could fit this universal light to . Surface mount, 2x bolt fitting. 4x White LEDs. Plastic Body & Lens. Can Take 12/24v bulbs (not supplied). Many Possible applications including HGVs, Lorrys, Recovery Vehicles, Trucks, Buses, Trailers, Kit Cars, Vans & Caravans. Universal Bolt Mounting. 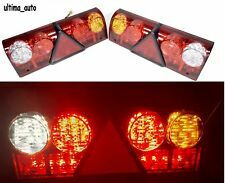 10pcs set 12V LED 6 SMD AMBER SIDE MARKER LIGHT POSITION TRUCK TRAILER LORRY BUS CAB CARAVAN HGV. DISTANCE BETWEEN FIXING HOLES : 85 MM. COLOR: AMBER. New SMD LED technology- much brighter than ordinary LEDs.